Installation View of Voluta by Yuko Mohri. Yuko Mohri, Voluta (detail – wire and lens), 2017. 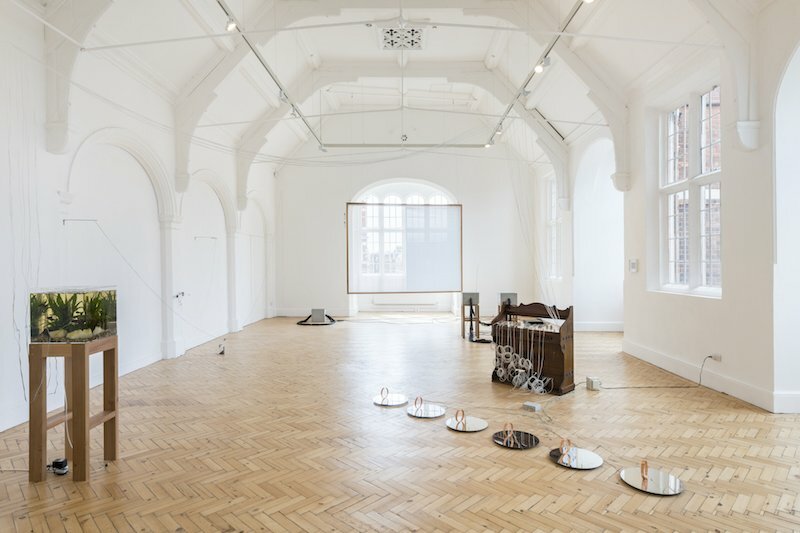 Peter Fraser’s Mathematics (Installation view) at Camden Arts Centre 2018. The Camden Arts Centre, a Grade 1 listed Victorian building on London’s Finchley Road (closest underground station is Swiss Cottage), has been gathering scale and momentum since the 1960s, and particulary since the directorship of Jenny Lomax in the 1990s, and its last refurbishment and redesign which was completed in 2004. 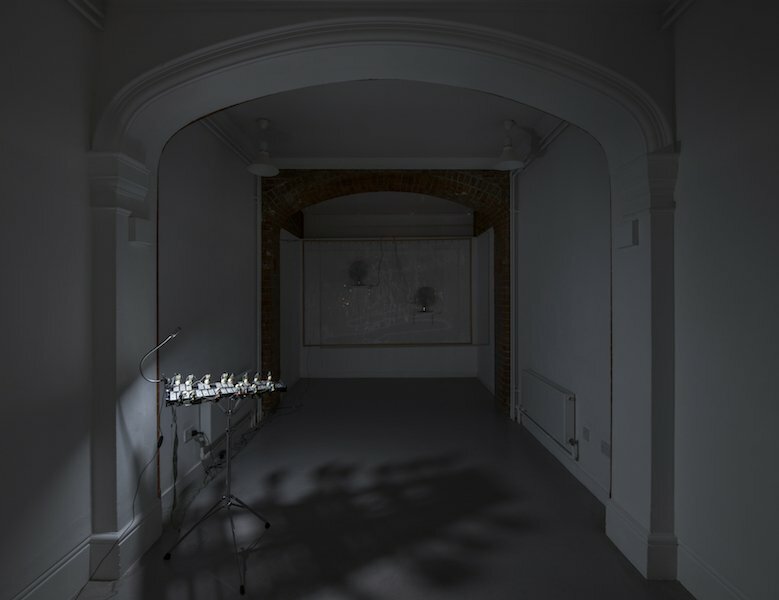 Japanese artist Yuko Mohri’s two month residency at the centre came about through her winning of the Nissan Art Award’s Grand Prix in 2015 – thanks to the Camden Arts Centre’s partnership with Arts Initiative Tokyo, the residence was part of the prize. With high ceilings, wide parquet floors and period detail, this is a building whose limitations make it special – listed status means no humidity control, no air conditioning, no thick glass, no vacuum insulating the artist from the outside. Two months of working here is to embrace history and inhale London itself. Programme Curator, Gina Buenfeld remembers Yuko Mohri as being “highly attuned to her surroundings… interested in the immaterial, the invisible, the transient.” The fruits of an artist who engages with the transient are fully displayed here. The Voluta exhibition splits into two rooms, the first airy, light, spacious, sheltering the largest installation, entitled Flutter, a second installation, called Voluta, and one of two framed untitled works. In the hallway outside these two rooms is the first of Yuko Mohri’s untitled works – this silkscreen, depicting ionic columns and sea shells hints at themes of sacred geometry, the force of the spiral, and the eternal and unseen energies that surround us. Flutter incorporates 25 separate materials: at one end, light sensors attuned to the movements of fish control the spectral peddling of a 1934 Yamaha reed organ. In a fragile, sinewy chain, compass needles, a spoon and a Cuban bell open and close circuits which eventually operate blinds. 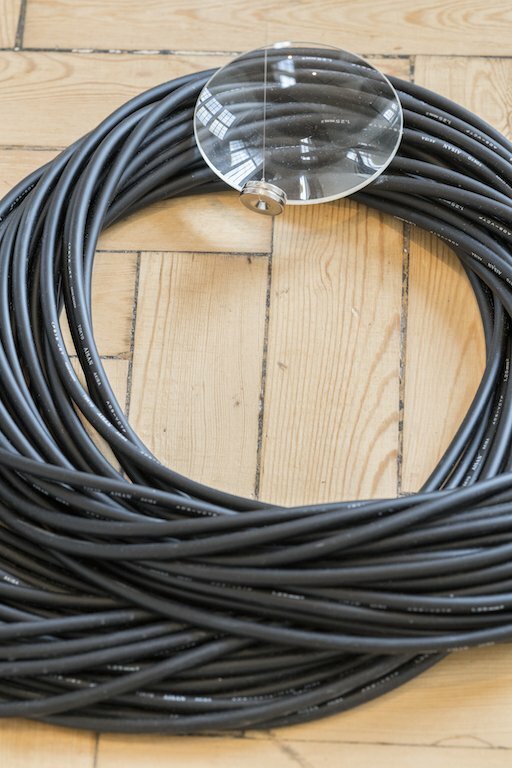 In Voluta, sound is pumped through coiled wires with magnetic results, a concert of wired electricity and concrete gravity to tweak spindly thread. Staff at the Arts Centre note that most people spend around 20 minutes in this room. To do so is to unconsciously open oneself to the immersion of transience. Traffic throbs as wind gusts through the open windows; as the clouds break, sunlight streams through and strikes the mirrored surfaces on the herringbone parquet; the organ hums in ghostly, tuneless variance, the bell chimes as the crackling blinds open; metallic spheres tinkle against the wood, whilst magnets palpitate against the glass. All life is here. The second room is darkened, and is the forum for Oni-bi (fen fire). This beautiful work harmonizes fans at one end of the room with a gentle metallophone at the other. The attendant sparks and chimes are remiscent both of fireflies and of temple bells, an other-worldiness which emphasizes the spirituality of Yuko Mohri’s works. In both rooms, chain reactions are logical but unpredictable, technical yet organic. The injection of electricity and magnetism serves not to underline mankind’s intrusion into the ineffability of the universe, but to mimic the universe’s own forces, the slender fragility of each outcome underscoring the tenuous threads of our science and understanding. Shown simultaneously with Voluta is Peter Fraser’s Mathematics. Like Yuko Mohri, who includes tributes to John Cage and to Marcel Duchamp in her exhibition, Peter Fraser openly discusses his primary influences; these are mathematical first and foremost; Artistotle, Pythagoras, Galileo, who said: “The world is a beautiful book, written in the language of mathematics.” His two rooms of colour photographs of everday situations give life to Max Tegmark’s belief that the universe is a physical expression of mathematics. There is visual sympathy with Yuko Mohri’s work in the appearance of seashells, but more thematically, in their shared quest to unearth the hidden codes, formulas and energies which bring about what we might simply see as beauty. We interviewed Yuko Mohri about Voluta and her experience at the Camden Arts Centre. What impact did your residence in Camden have on your art in general and on the creation of Voluta? I stayed at Camden two years ago, I still remember that I was so impressed by the architecture. The artist’s studio, appearing at first glance to be empty, was actually full of elements, such as a high ceiling, a spiral stairs, a Victorian-style bay window, or invisible things like natural lights and winds coming through the window. 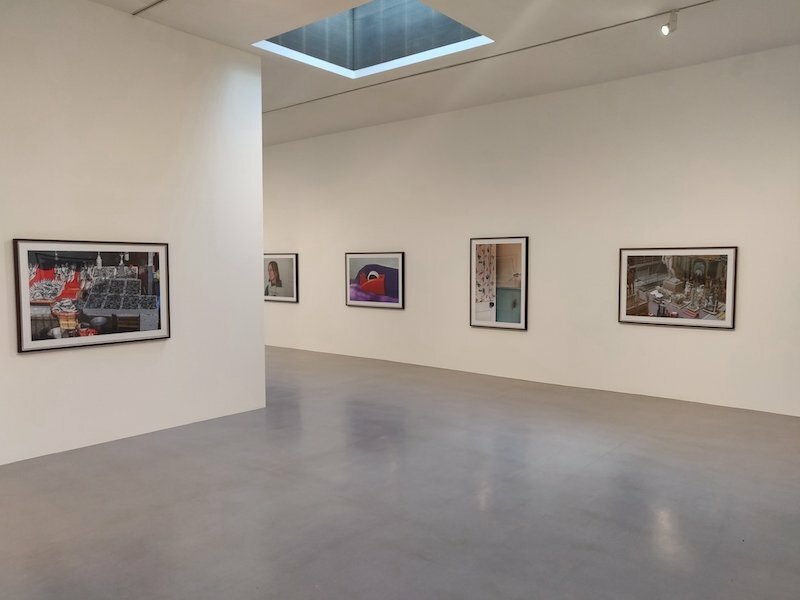 And I am inspired by the space of gallery 3 where I exhibit now: it has a lot of historical features of the architecture, unlike the gallery 1 or 2, which are rather oriented for a basic white cube space. I am rather intrigued by a rain leaking, a dew condensation, draughts, or an exhibition room being occupied by cows (really happened in India)…In Japanese, we often use a concept of time, like Suki (Openness) or Manuke (out of tempo, a state in which something necessary is lacking), as a metaphor to express architectural features. I like these Suki and Manuke blemishes found in any architecture, things all architects probably want to hide. Any white cube contains a “nature” that can not be hidden. I like amplifying this “nature” in my work. The nature, for me, is error, improvisation and feedback. The high ceiling of Camden Arts Centre is my favourite. I realized during my residency program in the Centre, the reverberation of sound lasts a long time in the space. I decided to use the organ so as to make use of this architectural feature. What connects your new Voluta series to Oni-bi? The exhibited works, especially Flutter and Oni-bi, play instruments through invisible materials. Both are developed from a series of work that I started to make, when I inherited a hand-made instrument of a composer-organist who passed away. I cleaned and fixed his instrument which was completely broken at that time, and I added a function of automatic performance system playing through a solenoid. Then it was reborn as a new work which generates sounds varying from different elements (lights, movements…) in a space. That means it creates music without human existence. He – the composer – is absent in any case. Oni-bi, in East-Asia, is said to be the appearance of the soul of dead people appearing as fire. Is there any psychological link between this show and your More More/Leaky Situations project? More More is another project and it is made from another context. Using different objects, the installation showcased improvised ways to react to leaky situations, which we often encounter at station yards in Tokyo. However, I can say that it is in a way related with error, improvisation and feedback, that I mentioned earlier. Furthermore, the title of this exhibition, Voluta, evokes a movement of energy in circle. In my show, a circle-shaped object such as a coil, generates invisible energy. It influences electric circuits, animating space in a circle, before finally creating a situation like an ecosystem. I think this circular system can also be found in More More. What writers or philosophers particularly inspire you? Heraclitus, Epicurus, John Cage, Marcel Duchamp, Georges Didi-Huberman, Daisetsu Suzuki, Fujio Akatsuka.